Shortly after VE Day on the 8th of May 1945, leaders of various churches, together with representatives of the British Legion, met Herbert Morrison, the home secretary in the wartime coalition government, to discuss the form that national remembrance should take once hostilities were concluded. Their view was that a single day should be chosen ‘in commemoration of two national deliverances and of the fallen in both of the wars’. This, they argued, should not be the 11th of November, partly because of ‘the uncertainty of the weather’ and partly – a somewhat obscure note – because it tended ‘to collide with Civic Sunday, which follows the election of new mayors’. Instead, they proposed that some time in May might be appropriate, and Morrison seemed sympathetic to their view, being personally inclined towards VE Day itself. As the coalition dissolved, it fell to Morrison’s successor, Donald Somervell, to bring the matter to cabinet. With no certainty that the war with Japan would be finished by November, he proposed that for this first year, the commemoration of Armistice Day should continue, a decision made easier because in 1945 it fell on a Sunday. The final decision could then be put off until the following year. And so, for what was assumed in official circles to be the last time, the Cenotaph again became the focus of the nation’s thoughts on the eleventh hour of the eleventh day of the eleventh month. King George VI, accompanied by his daughter Princess Elizabeth in her Auxiliary Territorial Service uniform, joined large crowds for ‘the sudden well-remembered silence’, and laid wreaths on the monument. It was noted, however, that in some cities and towns, the numbers of those attending were not quite what they had been in the 1920s and 1930s. It was a world in which peace seemed scarcely sustainable, despite all attempts at reconciliation. In Berlin, it was reported, Germans commemorated the day for the first time, alongside the troops of the occupying Allied armies, and in Jerusalem, Arabs and Jews attended a service in a British military cemetery, where prayers were offered for the future of Palestine. But in Washington, the newly elected British prime minister, Clement Attlee, joined the American president Harry S. Truman and Canadian prime minister Mackenzie King to lay wreaths on the Tomb of the Unknown Soldier ‘before boarding the Navy yacht Sequoia to discuss the atom bomb and other grave problems’. 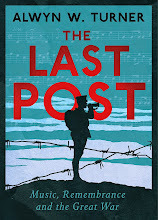 My book on The Last Post has now been published and received its first (four-star) review, courtesy of Peter Parker in the Sunday Telegraph. An edited extract was published in the Daily Mail yesterday and is available online. I can also be heard speaking on the subject on a BBC World Service documentary about memorialisation. Last week one of those polls about public perceptions showed that we in Britain exaggerate the number of Muslims in the country by a factor of four. And we're wrong about the number of immigrants and unemployed as well. We are all, apparently, pig-ignorant and there is no hope in us. Happily, however, this week the government has announced that we're all going to be sent a statement of what they've been buying with our income tax and national insurance tax. So we won't be quite as ignorant about one thing at least. Obviously it's propaganda - it is, after all, information issued by the government - but I fear that the left is self-aggrandising if it thinks that this is a first shot in a post-election attack on the welfare state. That may be an added bonus; it's certainly not the primary target. Everything now is about the election, not about what happens after. So the real issue is not the benefits section at the top of the list, but the overseas aid and EU contributions at the bottom. These latter are the two smallest items of public expenditure apparently. Which makes a nonsense of claims that that's where some real savings could be achieved. In other words, the whole exercise is aimed at UKIP, whose economic policy - such as it is - is based on cutting these two areas. Which is not to deny that after the election the benefits bill be attacked. Of course it will be. No matter what government is elected, benefits are going to be cut. But to return to the principle of the thing. The left is making another silly mistake if it simply attacks this idea as propaganda. Allowing people to know how their money is being spent is a perfectly reasonable exercise in democracy. If a Labour government had had the intelligence to come up with the initiative, maybe they could have determined the categories and weighted the presentation in their favour. They didn't, and it's bugger all use bleating about the Tories skewing the stats. That's what governments do; it's what Labour should have done. Rather than complain, Labour should offer its own proposals about educating us. Maybe about the numbers of immigrants and unemployed or something. It's not a bad thing to have some information.